You’ve no doubt spent ages trawling around the shops getting the uniform ready. The shoes are polished and everything is ready for that day the children are back to school. So here are a couple of tips to help you get the best possible photo of your child to look back on in years to come. Give a little space between the child and the background. Standing right against the background will usually result in harsh shadows which don’t look great and can ruin the image. Get your child to stand in one particular identifiable spot. Get them to hold a sign (maybe that they’ve written) showing the year. Then next year take the same photo in the same place. Then in years to come you can look back on the images (which are conveniently dated) and see how they’ve grown. If you choose to do the above and get your child to write the sign, get them to write the name of their best friend(s) and their favourite hobby or TV program. Again over the years you’ll see the changes. Most cameras have a self-timer option. 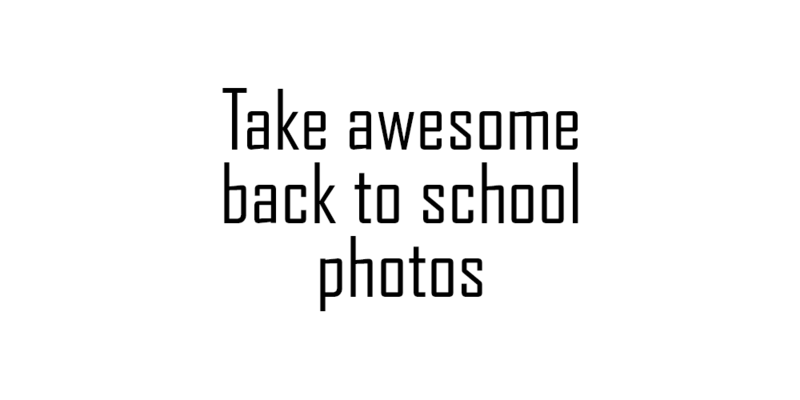 Don’t forget to use it and get a quick family snap of you all together on that first morning. If you have to you can even take a selfie on your iPhone. Last but not least, make sure you enjoy the moment. It is going to be emotional. Make sure you enjoy and take it all in. Oh and tears are ok, just try not to get them in the photos!